When the calendar turned to Jan. 1, 2017, the overriding sentiment surrounding markets and the global economy was uncertainty. Uncertainty over what U.S. President Donald Trump’s agenda would be, the fate of the North American Free Trade Agreement and the likelihood of a tax bill being passed. Similar unpredictability followed Brexit and the consequences of the negotiations to follow. There was economic turmoil in Venezuela, political upheaval in the Middle East and question marks surrounding China’s economic growth. What happened was corporate earnings grew and global economies collectively gained strength. When the dust settled — and against all odds — the Dow Jones Industrial Average had increased 25.7 per cent while the S&P/TSX gained almost six per cent to close at a record 16,209.13. For the first time in two years, oil prices were not the top headline grabber. There was plenty of speculation as to whether production cuts instituted by the Organization of Petroleum Exporting Countries — with the co-operation of Russia — would stick, and questions surrounding the mid-year change in leadership in Saudi Arabia, where Mohammed Bin Salman, who wants to diversify the kingdom’s economy, became the heir apparent. How he plans to monetize the country’s resources at the same time as he has embarked on a radical modernization plan for the Kingdom — which means he needs a higher oil price — remains to be seen. The world will be watching for developments regarding the privatization of Saudi Aramco, which is still slated for 2018. Shale production south of the border continued to grow, but it wasn’t enough for the U.S. to hit the 10-million-barrel-a-day mark for production. It also sent an average 1.5 million barrels a day offshore in the fourth quarter. Also significant in 2017 was the exit of foreign oil companies from the oilsands — Royal Dutch Shell, Marathon Oil, ConocoPhillips, Statoil, Apache, Japan Petroleum Exploration Company and the increased control of the oilsands resources by Canadian players Suncor, Canadian Natural Resources and Cenovus. Nevertheless, North America’s West Texas Intermediate finished the year at US$60.42 — up 12.5 per cent and the first time since June 2015 that it has traded above the $60 mark. Brent crude finished the year up 17 per cent at $66.92. Natural gas prices didn’t fare as well — sliding through the year and causing Alberta companies to slash capital expenditure budgets by $660 million. Henry Hub pricing south of the border was under the US$3 per MMBtu mark, and Alberta’s AECO pricing was well below $2 per thousand cubic feet by year’s end. Despite the rise in oil prices and due to the weakness of natural gas prices, the S&P/TSX Energy Index lost almost 13 per cent of its value in 2017, rebounding in the second half of the year to close near 193. And, sadly, there was no escaping the pipeline drama. True to his word, Trump approved TransCanada’s Keystone XL project — but there remained uncertainty regarding the pipeline’s need for the route to pass through Nebraska. The state’s Public Service Commission approved the project in November, but it was not TransCanada’s preferred routing. The commission rejected TransCanada’s request to retroactively file an amended route on Dec. 19 — leaving the timing of the project undefined. 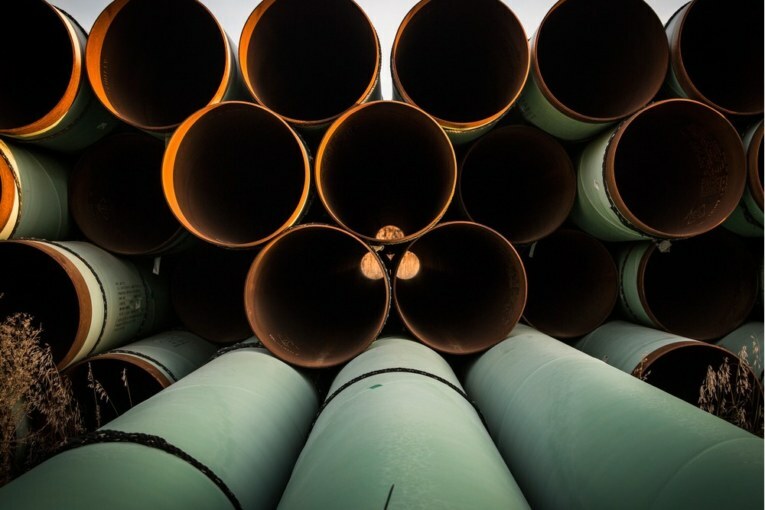 The approval of KXL offset the frustration and disappointment regarding TransCanada’s other project, Energy East, thanks to the mandate creep of the panel appointed by the National Energy Board to review the project. It decided to include the review of upstream emissions of the project. The combination of cost and further uncertainty was enough to prompt TransCanada to pull the plug and focus its efforts elsewhere. After Kinder Morgan’s Trans Mountain expansion had received federal approval, a change in government in British Columbia, which saw an NDP and Green Party coalition, emboldened opponents. In the midst of all this, Kinder Morgan Canada completed an initial public offering — as a way to send a message to B.C. and Ottawa that not only did it have faith in the prospects of the project going ahead, so, too, did investors. Where there was positive news on the pipeline file it was the acquisition of Veresen by Pembina Pipelines in May for $9.7 billion in a cash and stock deal. The Alberta-based pipeline company has been growing — almost under the radar — in the past two years and the Veresen deal was the largest in its corporate history. Even more significant was the fact Veresen came with the Jordan Cove Liquefied Natural Gas project in Oregon, for which the company reapplied to the Federal Energy Regulatory Commission in September and announced in December that it would spend $135 million to advance the project. The year also saw Canada continuing to sit on the sidelines of the LNG game — as Petronas officially cancelled Pacific Northwest LNG, leaving LNG Canada, which is led by Shell, as the most promising option to get Canadian natural gas flowing into international markets. Markets and investors received a few wake-up calls throughout 2017. Whether it was the U.S. Federal Reserve raising rates — with more rate hikes expected to come in 2018 — the Dow Jones Industrial Average closing out the year near the 25,000 mark, Bitcoin investors understanding the meaning of the Greek Myth of Icarus or the improbable passing of U.S. President Donald Trump’s tax overhaul — these are events that will have long-lasting effects in 2018. In her final year as Fed chair, Janet Yellen oversaw three interest rate hikes — which, coupled with the effect of the U.S. tax reform, left many wondering what the two events would do to the market and investors. Amazon scored two huge wins in 2017. The first was to buy Whole Foods — the high-end grocery retailer often referred to as ‘Whole Paycheque’ — which set in motion a dramatic disruption process in the North American grocery sector to add to the big changes it has made in the retail space. The second was a marketing coup. How else to explain the effect of its decision to announce it was on a North American hunt for the right spot to set up its second headquarters. The news set North American cities a-twitter — with newspapers, business leaders and politicians speculating on which city had the right stuff to win the mandate. The winning bidder would also benefit from the US$5 billion in investment that would come its way, not to mention provide thousands of well-paying jobs — which was why major — and not so major — centres threw their hats into the ring. The response exceeded Amazon’s expectations, with the result that it had to push the naming of the winning city into 2018. And speaking of retail — in addition to Saks Fifth Avenue opening in downtown Toronto and waking up Holt Renfrew — the other big retail story was the demise of Sears Canada. After 65 years in Canada, the storied retailer filed for bankruptcy protection in June and was granted leave to liquidate its stores in October — but not after the process had become uglier than a Christmas sweater. There was the decision to pay bonuses to senior staff despite a shortfall in its pension obligations and allegations that merchandise was being marked up prior to the liquidation sales. Its demise put 15,000 people out of work and is creating headaches for the owners of shopping malls across the country, where Sears had leases. From the tangible of retail to the intangible quality of Bitcoin — the crypto currency that started the year with a US$950 valuation and reached $19,783 before closing the year at $13,928. The gut-jolting rise and fall of Bitcoin had many market watchers drawing parallels between the irrational exuberance of investors in the tech boom of the late 1990s and suggesting the best strategy for exposure to Bitcoin would be not to hold it as an investment. The uncertainty that characterized the beginning of 2017 is not manifest as 2018 begins. Between the record highs of stock markets, the beginning of an interest rate tightening cycle and stronger oil prices, 2017 was a year of surprises, which is not what was expected when the year began. This New Year begins on a decidedly different — if optimistic — note, and 12 months from now we will judge whether it was warranted.